Running backs coach Eric Studesville said Drake never complained about his lack of carries (7.5 per game) during the 2018 season, Barry Jackson of The Miami Herald reports. Drake rushed 11 times for 43 yards and caught all five of his targets for 52 yards during Sunday's 42-17 loss to the Bills. Drake rushed six times for 23 yards and caught four of five targets for 31 yards during Sunday's 17-7 loss to the Jaguars. Analysis: Drake has not seen a notable increase in touches despite the placement of Frank Gore (foot) on injured reserve. 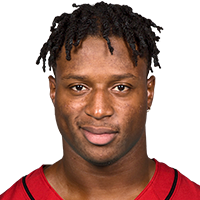 The third-year pro split carries with rookie Kalen Ballage, but neither runner was particularly effective during the Week 16 loss -- one in which Miami only managed 183 yards of total offense. Drake has not logged more than ten carries in a single game since Week 8, and his usage heading into a Week 17 tilt against the Bills will be difficult to predict. Drake (shoulder) was a full participant at Wednesday's practice. Analysis: Limited to non-contact work at practice the past month, Drake no longer has any restrictions as the Dolphins prepare for a Week 16 home game against Jacksonville, per Joe Schad of The Palm Beach Post. The third-year pro could take on a bit more work with Frank Gore (foot) on injured reserve, but it was rookie Kalen Ballage who served as the lead ballcarrier after Gore went down in Sunday's 41-17 loss to the Vikings. 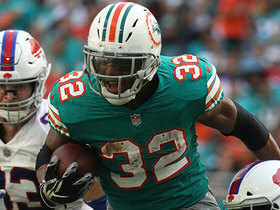 Coach Adam Gase confirmed that Drake's lingering shoulder injury had nothing to do with his lack of carries after Frank Gore (foot) was removed from Sunday's 41-17 loss to the Vikings, Barry Jackson of the Miami Herald reports. Drake (shoulder) rushed once for six yards and caught all three of his targets for 28 more in Sunday's 41-17 loss to Minnesota. 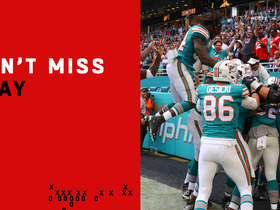 Analysis: The hero in last week's win over the Patriots was strangely quiet in this one, as the Dolphins opted to feature rookie running back Kalen Ballage after Frank Gore injured his ankle. 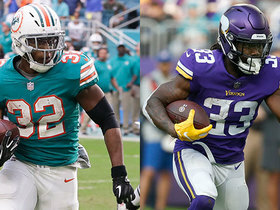 Expect Miami to continue with the thunder-and-lightning backfield approach should Gore sit out against the Jaguars in Week 16, with Ballage absorbing most of the early-down work and Drake operating as a receiver and in open space. Drake (shoulder) does not carry an injury designation for Sunday's game against the Vikings after practicing fully Friday. Analysis: Drake will be a go Sunday, as expected, which puts him in line to share Miami's Week 15 carries with Frank Gore. Drake has failed to log more than eight carries in each of Miami's last five contests, but he has made his mark scoring four TDs (a trio via passing plays) over the last three weeks. He'll take aim Sunday at a Minnesota run defense that had trouble stopping Seattle's ground game Week 14. Drake (shoulder) was a limited participant in Thursday's practice, Armando Salguero of the Miami Herald reports. Analysis: Drake's back-to-back limited practices shouldn't provide cause for concern regarding his status for Sunday's game in Minnesota. 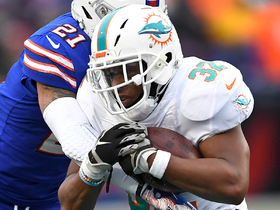 The Dolphins have simply been exercising caution in restricting the running back's exposure to unnecessary contact leading up to gamedays the last couple of weeks, which has thus far helped Drake avoid any setbacks with his shoulder. Expect him to split work out of the backfield with Frank Gore this weekend, as per usual. Drake (shoulder) was a limited participant at Wednesday's practice. Drake rushed six times for 24 yards and caught his lone target for a 55-yard touchdown in Sunday's 34-33 win over the Patriots. Drake (shoulder) doesn't have an injury designation for Sunday's game against the Patriots, Ben Volin of The Boston Globe reports. Analysis: Drake remains limited to non-contact work in practice but should be fine to handle his usual workload this weekend in a backfield timeshare with Frank Gore. The third-year pro hasn't made much of a dent on the ground since October, but he hit paydirt on receptions the past two weeks, giving him eight total scores for the season. Drake (shoulder) was a limited participant during Thursday's practice, Armando Salguero of the Miami Herald reports. Drake (shoulder) was limited at practice Wednesday. 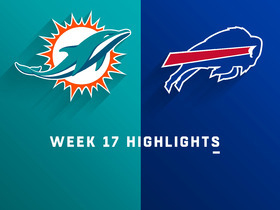 Drake rushed seven times for 31 yards and brought in two of four targets for 13 yards and a touchdown in the Dolphins' 21-17 win over the Bills on Sunday. Drake (shoulder) doesn't carry an injury designation into Sunday's game against the Bills after practicing on a limited basis throughout the week, Armando Salguero of the Miami Herald reports. Drake (shoulder) was a limited practice participant Wednesday, Armando Salguero of the Miami Herald reports. Drake is expected to be limited to non-contact work in practice this week after aggravating a left shoulder injury in Sunday's 27-24 loss to the Colts, Armando Salguero of the Miami Herald reports. Drake (shoulder) returned to Sunday's game against the Colts after missing only a few snaps, NFL.com's Michael Fabiano reports. Drake was removed from Sunday's game against Indianapolis in the fourth quarter with an apparent left shoulder injury, Cameron Wolfe of ESPN.com reports. Analysis: The Dolphins almost certainly will have time for at least one more drive, perhaps giving Drake a chance to return. He played a huge role in helping the team build a lead, taking seven carries for 28 yards and a touchdown and adding five catches for 64 yards and another score on six targets. Frank Gore figures to get most of the backfield snaps if Drake doesn't make it back into the game. 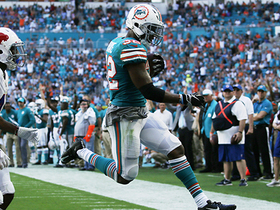 The Dolphins consider Drake questionable to return, per Adam H. Beasley of the Miami Herald. Drake (shoulder) remained limited at Friday's practice, but he doesn't have an injury designation for Sunday's game in Indianapolis, Armando Salguero of the Miami Herald reports. Analysis: Drake was limited to non-contact work throughout the week in an effort to avoid any aggravation of the shoulder injury he suffered during a Nov. 11 loss to the Packers. Coming out of a bye week, he should be fine to handle his usual role splitting work with Frank Gore, though there is some risk for an in-game setback if Drake takes a big hit in the wrong place. Indianapolis has had some issues against pass-catching backs, yielding 7.2 receptions per game (second most) to the position. Drake (shoulder) was still sporting a red non-contact jersey at Friday's practice, Joe Schad of The Palm Beach Post reports. Analysis: Drake has been a limited practice participant all week with the non-contact jersey, and he seems to be working similarly again Friday. The fact the 24-year-old has been at practice throughout the week is a decent sign, but his availability remains up in the air given the practice limitations. The release of the Dolphins' official injury report later Friday should provide further clarity on his status. The Dolphins listed Drake (shoulder) as a limited participant on Thursday's estimated practice report, Armando Salguero of the Miami Herald reports. Analysis: Since the Dolphins didn't hold a formal practice due to the holiday, the team maintained the "limited" label Drake received after going through non-contact work Wednesday. It's unclear if the Dolphins were just exercising precaution with Drake coming out of the bye week or if there's legitimate concern about his health, but the running back would assuage any worry about his prospects for Sunday's game against the Colts by returning to full participation at Friday's practice. Drake (shoulder) was listed as a limited practice participant Wednesday, Armando Salguero of the Miami Herald reports. Analysis: Per Salguero, Drake sported a non-contact jersey during Wednesday's session, so the running back's status will need to be monitored as Sunday's game against the Colts approaches. If Drake is out or limited this weekend, added backfield work would be in store for Frank Gore, as well as Kalen Ballage to a lesser extent. Drake (shoulder) was spotted wearing a red non-contact jersey at Tuesday's practice session, Adam H. Beasley of the Miami Herald reports. Drake took eight carries for 27 yards and caught both of his targets for 11 yards in Sunday's 31-12 loss to the Packers. Analysis: Drake played 34 of 68 snaps (50 percent) on offense, marking the ninth straight week in which his snap share landed between 45 and 66 percent. There's little reason to expect a change in roles after a Week 11 bye, considering Frank Gore rumbled for 90 yards on 13 carries during Sunday's ugly loss. Drake did miss some time in the second quarter with a shoulder injury, but his ability to rejoin the contest suggests he should be in decent shape for Week 12 at Indianapolis after the bye. Drake, who was forced out of Sunday's game against the Packers with a shoulder injury, was subsequently able to return to the contest, Chris Perkins of The Athletic reports. Analysis: Drake will thus re-enter Miami's backfield committee in Week 10, which has been so far led by Frank Gore, with Kalen Ballage in reserve. Analysis: Prior to his exit from the contest, Drake ran four times for 15 yards and caught one pass for three yards. In his absence, added backfield touches are available for Frank Gore and Kalen Ballage. Drake carried three times for nine yards and caught four of six targets for an additional 26 yards during Sunday's 13-6 win over the Jets. Analysis: Drake was an afterthought in the running game, watching as Frank Gore received 20 carries on the day. He was the more involved of the two backs in the passing game, but he averaged just 4.3 yards per target in what was an underwhelming performance. Drake had enjoyed a fair amount of success over the last four games, making this poor effort even more frustrating for his fantasy owners. 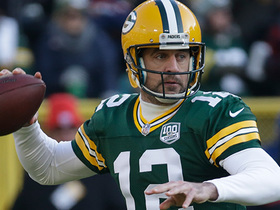 He'll look to get back on track in Week 10 against the Packers. 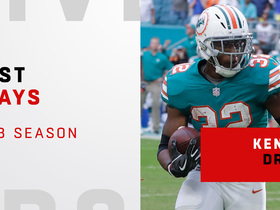 Watch the 2018 season highlights from Miami Dolphins running back Kenyan Drake. Nfl Network's Akbar Gbajabiamila picks which players you shouldn't start for Week 15 in fantasy. 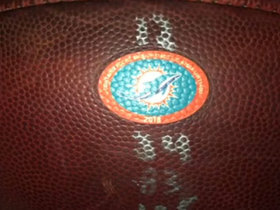 NFL Network has tracked down 'Miami Miracle' football that Miami Dolphins running back Kenyan Drake threw into the stands after scoring on the final play of regulation to beat the New England Patriots in Week 14. 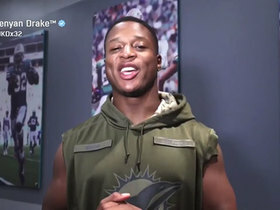 Miami Dolphins running back Kenyan Drake posted a Twitter video pleading for the fan who has the football from his "Miami Miracle" touchdown to return the ball to him. NFL Network's Michael Fabiano reveals five players you should beware of starting in fantasy moving forward.